Kögel will be presenting its portfolio for forwarding companies and the construction industry at the Transport Compleet in Hardenberg. From 13th to 15th March 2018, visitors can take a closer look at the best-selling Kögel Cargo at the Kögel Stand 143 in Hall 1. The exhibited platform semi-trailer scores well with its ruggedness, the extensive standard equipment and diverse customised equipment. In addition to its high working quality, the Kögel Cargo has impressively low maintenance costs and can be used really flexibly. The highly stable frame has a sophisticated cross beam arrangement for transporting heavy loads and for use in a very wide variety of road conditions, daily loading operations, and extreme conditions. The floor load-bearing capacity can bear high fork-lift axle loads of up to 7.2 tons. The Kögel Cargo also has a low tare weight and a very robust body. Thanks to the two continuous roof frame profiles, no post supports are required when the side tarpaulin is open. The empty trailer with its basic equipment weighs as little as approx. 6,000 kilogrammes. This makes it ideally suited for payload-intensive transport. 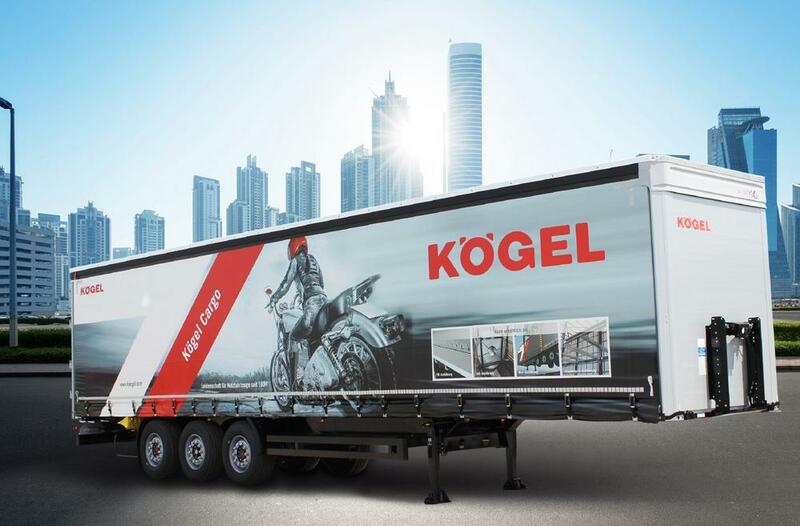 The Kögel Cargo is also equipped with the directionally stable and reliable KTA trailer axles as standard. The unique “double suspension” of the KTA, made from a soft rubber bearing and a spring steel wishbone, not only enhances the driving characteristics of the trailer, but also reduces tyre wear. On the Kögel Cargo, no belts hang down in the loading area when the roof is open; they are integrated into the roof awning. This entirely eliminates straps snagging on the load. For optimum load-securing, there are 13 pairs of lashing rings, each with an optional 4,000 kilogrammes of tensile force, set into the Vario-Fix perforated steel external frame to enable almost infinitely variable lashing of the cargo. It goes without saying that the Cargo has the DIN EN 12642 Code XL load-securing certificate. The Cargo on display at the Transport Compleet 2018 also shows a wide variety of individual features. These include, for example, a 12-millimetre-thick and 2,500-millimetre-high textured coated board on the inside of the front wall for increased front wall loading. A 720-millimetre long transition plate, made of steel chequer plate, is mounted above the rear end beam. Furthermore, the exhibit is provided with reinforced steel rubber bumpers for increased collision protection. An eight-millimetre-thick lateral steel bracket across the entire width and locking cam protection mounted centrally on the end plate of the frame are fitted as forklift protection. Additional special equipment includes a toolbox, an axle lift for the first axle and much more. Kögel is one of the leading trailer manufacturers in Europe. Since it was established in 1934, the company has manufactured more than 550,000 trailers. With its commercial vehicles and solutions for freight-forwarding companies and the construction industry, the company has been providing ‚Made in Germany‘ engineering quality for more than 80 years. During this period, it has maintained its passion for transport and innovation, enabling it to offer proven, long-lasting added value to freight-forwarding companies. The company headquarters and main production facility of Kögel Trailer GmbH & Co. KG are located in the Bavarian town of Burtenbach. Kögel also has factories and offices in Ulm (Germany), Duingen (Germany), Chocen (Czech Republic), Verona (Italy), Zwolle (Netherlands) and Moscow (Russia).